Are you currently tracking these conversions? If not you should consider spending a few moment to learn more about analytics / web traffic analysis. Once you begin tracking these key conversion points on your website, the next step is optimize your conversion funnel by paying close attention to the experience of your visitors (sometimes called users). The meaning is probably exactly what you think it is, it is how a person feels or experiences your website and or product or service. A simple, direct, and positive experience can lead to more leads, more phone calls, and even more revenue. An experience that is arduous, aggravating, and scattered can lead to a higher bounce rate, no leads, no phone calls, and ultimately no revenue. This is why it is so crucial to understand not what you think works for your users, but what actually works for them. One way to find this out is through testing. 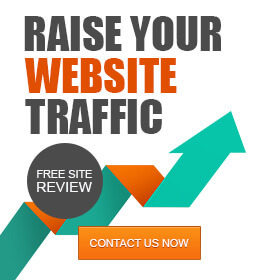 There are a number of platforms designed to help create and facilitate the the testing of your website visitors as well as a number of different methods for testing. The methods I am most familiar with are Split Testing, also sometimes referred to as A/B testing and Multivariate Testing. You can apply this type of testing to both desktop users as well as mobile ones, keeping in mind a mobile SEO approach. The idea being that there may be language, a layout, or an image that triggers conversion behavior from a larger percentage of your visitors than your current web page. The image below is a primitive example of how this might pan out. 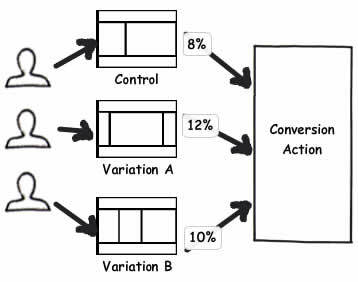 As you can see variation page A has a 4% higher conversion rate for the desired goal action than the control (existing) page. If your website averages 10,000 visits per day and sells 800 widgets for an average of $30 each, this is a potential $12,000 per day improvement – that’s $360,000 a Month! Multivariate testing is just like it sounds; the testing of multiple variables at the same time. The idea behind multivariate testing is that it may take more than one messaging, layout, or design change to see a significant improvement in your user’s conversion behavior. Common multivariate tests utilize column-based layouts to move the same, or very similar, pieces of the layout design around the page in variations to test overall conversion impact. For example take a look at the example below. 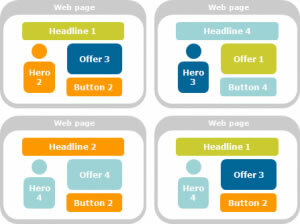 As you can see in the above example, elements on the page are separated into headlines, offers, and buttons, each designed to test the impact of conversion based on a target conversion audience of 3 different ‘heroes,’ or champions.